Is there any plausible explanation for why so many stories about Jagmeet Singh’s penchant for hanging around with people that glorify terrorist and advocate violence came out at the same time, other than Singh was threatening Trudeau? We all know that the prime minister’s trip to India, a trip that was mostly a family vacation coupled with photo-ops for the next election, was a disaster. 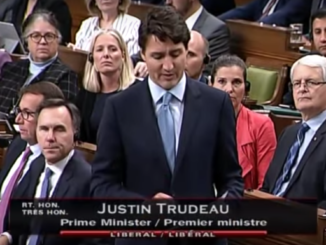 From the mocking of his outfits to the diplomatic rift he caused with India, Trudeau’s vote seeking trip did not go as planned. Attack the guy that threatens your hold on certain left-wing and ethnic votes. 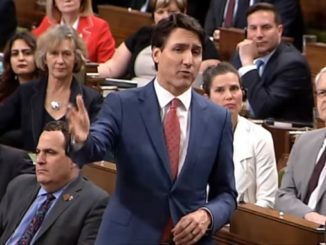 It wouldn’t do for Trudeau to have a handsome young man, a brown guy no less, in better suits than he wears, scooping up lefty votes in areas that Trudeau needs to win. So what do you do? You make sure the Liberal machine lets reporters know that Singh is willing to play footsie with the terrorist/extremist wing of Canada’s Sikh community. I mean what better way to make the public forget that you invited a guy who tried to kill an Indian cabinet minister to events you were holding in India than by saying, look, that guy is worse! So a series of stories appeared, first in The Globe, then Postmedia, then Macleans, and finally The Sun, all showing Jagmeet Singh being cozy with, standing next to or taking support from people that advocate violence to set up a Sikh homeland, carved out of the Punajb region of India. 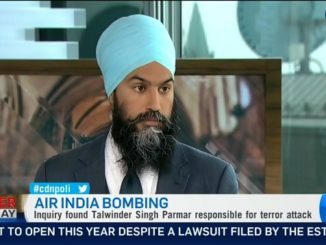 In the past, Jagmeet Singh has been unwilling to denounce or even name the mastermind of the Air India terrorist attack. Before 9-11, Air India was the single biggest terrorist attack using aircraft and the plot was hatched and carried out on Canadian soil by Talwinder Singh Parmar. 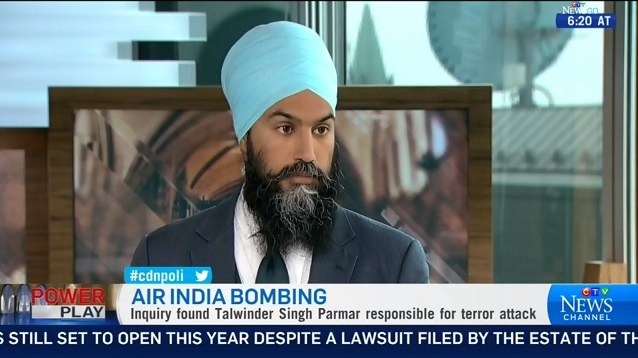 As recently as last fall, Jagmeet Singh refused to acknowledge that Parmar was behind the bombing that killed 329 people, including 268 Canadians, on June 23, 1985. In fact Singh and his supporters claimed it was racist to ask him about Parmar and Air India despite his appearance at events where Parmar was honoured as a martyr for the Sikh homeland. Now he is denouncing Parmar by name and saying he does not back terrorism but added that if asked again, he would go to events that do honour these “martyrs” or what most of us would call terrorists. You can watch Singh’s full appearance on CTV’s Power Play below but you can also hear from Ujjal Dosanjh, former BC Premier and federal cabinet minister, who fought against radicals in his own community appear on my radio show here. Dosanjh isn’t sold that Singh has done enough. I have to agree, Singh is trying to say he denounces violence while still getting to go to the events and play nudge, nudge, wink, wink politics with people that prefer the gun to the ballot box. Watch Singh on CTV here. Canada is now a joke.